Welcome to the JNHT St. James Heritage Sites. St. James Parish Church - was built between 1775 and 1782. 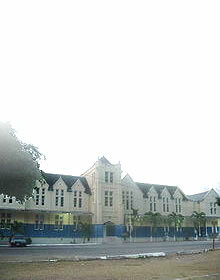 St. Mary's Anglican - situated on the Montpelier Estate, which dates back to the days of slavery. 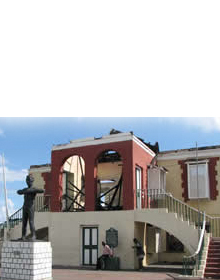 Historic Court House (Mobay) - Built in or around 1774, an important monument in St. James' history. 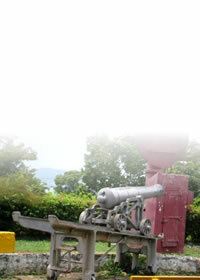 Fort Montego - It housed four 12 pounder guns and five smaller guns. Rose Hall Great House - built in the mid 19th Century by George Ash for John Palmer, Custos of St. Thomas for £30,000. 1 King Street - the property at this location was formerly the Manse of the Burchell Baptist Church. Sam Sharpe Square -The square includes several heritage structures: the Sam Sharpe Monument, the Cage, the Civic Centre and the Freedom Monument and a fountain. Old Slave Ring - It is said that on this site prospective buyers viewed the slaves as they were paraded and auctioned. The Dome - erected over the source of the creek in Montego Bay. Town House - A keystone on the arch suggests that the Town House was built in 1776. Montego Bay Railway Station - built around 1894, a simple timber building. Montpelier Railway Station- a uniquely designed building which demonstrates Jamaica/Georgian architecture with Victorian elements.